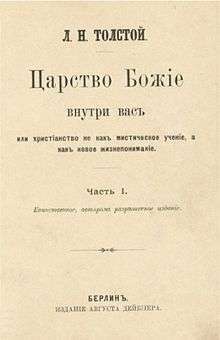 The Kingdom of God Is Within You (Russian: Царство Божие внутри вас [Tsarstvo Bozhiye vnutri vas]) is a non-fiction book written by Leo Tolstoy. A philosophical treatise, the book was first published in Germany in 1894 after being banned in his home country of Russia. It is the culmination of thirty years of Tolstoy's thinking, and lays out a new organization for society based on a literal Christian interpretation. The Kingdom of God is Within You is a key text for Tolstoyan, nonviolent resistance, and Christian anarchist movements. The title of the book is taken from Luke 17:21. In the book Tolstoy speaks of the principle of nonviolent resistance when confronted by violence, as taught by Jesus Christ. When Christ says to turn the other cheek, Tolstoy asserts that Christ means to abolish violence, even the defensive kind, and to give up revenge. Tolstoy rejects the interpretation of Roman and medieval scholars who attempted to limit its scope. Tolstoy took the viewpoint that all governments who waged war are an affront to Christian principles. As the Russian Orthodox Church was—at the time—an organization merged with the Russian state and fully supporting state's policy, Tolstoy sought to separate its teachings from what he believed to be the true gospel of Christ, specifically the Sermon on the Mount. Mohandas Gandhi wrote in his autobiography The Story of My Experiments with Truth (Part II, Chapter 15) that this book "overwhelmed" him and "left an abiding impression." Gandhi listed Tolstoy's book, as well as John Ruskin's Unto This Last and the poet Shrimad Rajchandra (Raychandbhai), as the three most important modern influences in his life. Reading this book opened up the mind of the world-famous Tolstoy to Gandhi, who was still a young protester living in South Africa at the time. ↑ Donna Tussing Orwin (2002). The Cambridge Companion to Tolstoy. Cambridge University Press. ISBN 0-521-52000-2. ↑ Christoyannopoulos, Alexandre (2010). Christian Anarchism: A Political Commentary on the Gospel. Exeter: Imprint Academic. 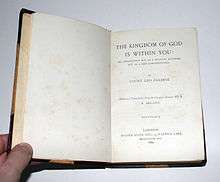 p. 19. [Tolstoy] wrote countless essays and books on the topic, but the most often cited one among anarchists is The Kingdom of God Is within You. ↑ Mohandas K. Gandhi (1929). The Story of My Experiments with Truth. ↑ "'"Leo Tolstoy and Mahatma Gandhi: A Double Portrait in the Interior of the Age"- Russian documentary which captures correspondence between the two spiritual teachers of humanity'". Press Information Bureau. Retrieved 5 December 2016.